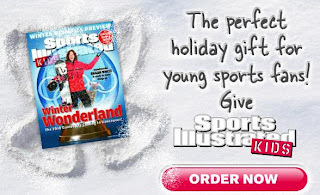 Being Frugal and Making It Work: SPORTS ILLUSTRATED Kids: Special Holiday Offer! For more information you can visit the Sports Illustrated Kids website! And don’t forget – take advantage of this great special offer. Do you know a child that would love Sports Illustrated Kids? This would be a great gift for my 2 boys to share, they are 6 and 9. Both are quite active in multiple sports, although only one sport at a time. I hold school work above all! Great price too, they would probably like it on the tablet, I like to look at actual magazines. Thanks for the info!